On the Greek island Lesvos refugees are protesting for more than a week now. Some of them started a hunger strike on Friday, others joined over the weekend. One person is refusing to drink water. They need our support. 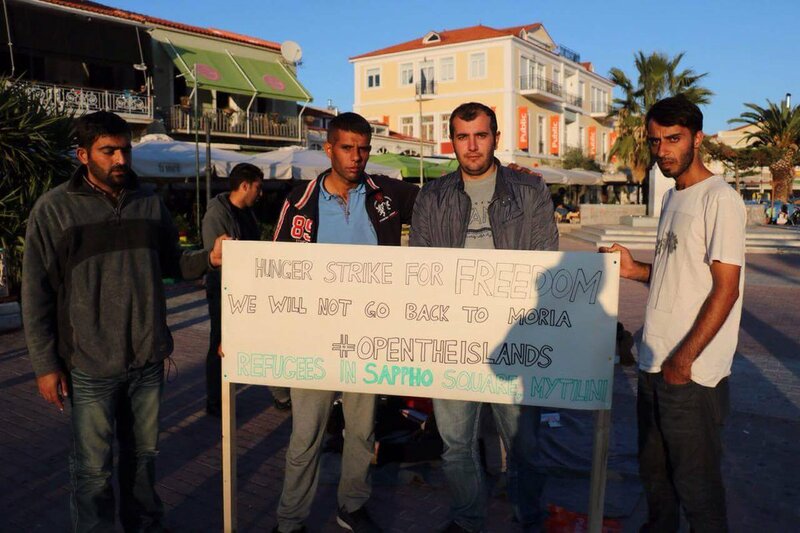 Image: Protesting refugees started a hunger strike on Lesvos on October 27. Inage by Twitter account @AHampay.Published by Enough is Enough. Read all our reports about Lesvos; here. On the Greek island Lesvos refugees are protesting for more than a week now. Some of them started a hunger strike on Friday, others joined over the weekend. They need our support. The protests started at October 21, the refugees demand to open the Greek islands and let them travel to the main land. On friday four of the protesting refugees started a hunger strike. Refugees have been protesting for over one week now in Sappho Square, Mytilini. They have been hoping against hope that their call for justice will be heard, but still the people in power who are responsible for their suffering have yet to listen. Four of the demonstrators have decided to start a hunger strike untill their demands are met. I want to tell you what they demand. They demand freedom, that very primordial and basic of human rights! The protesters and the hunger strikers want freedom, they want to be released from this open air prison of Lesbos. They want to be released from the concentration camp that is Moria. The refugees demand that the Greek government accept these people as refugees, otherwise let them leave this island and this country so that they can seek refuge and asylum in another country. We demand an end to our captivity! We demand our freedom! We demand dignified and respectfull treatment! We demand that you follow your own laws. We have experienced many years of oppression, wars, bombs and authoritarian regimes. We have sought refuge from you, for freedom and for safety. If you do not give us that safety and refuge, relsease us from this captivity. Do not deport us back to our countries! Do not deport us to countries that are ruled by authoritarian regimes and dictatorships. Armin Hanare, Hessam Shaeri Hesari, Sherzad Ahmadian and Reza Haidari. On Saturday another protester started a hunger strike and on Saturday they were joined by somebody who is refusing to drink water. In regard to clothes, we require clothes especially warm/long sleeve items or even isothermal if possible and there will be a constant demand throughout the period that the refugees will be at the square. Refugees are protesting again and again for the freedom of movement and the inhuman conditions on the Greek islands. Enough is Enough is one of many groups who support the Open The Islands campaign. But considering the fact that the conditions are getting worse and worse for people who are forced to stay on the Greek islands we think we need to do more. Winter is coming and the dying at EU borders has to stop. Its about time to start a wave of solidarity actions across Europe. The EU member states should immediately cancel the EU/Turkey deal and open their borders. Get active and support the refugee struggle for the freedom of movement. In a documentary that we produced about the situation on Lesvos, we exposed the inhuman treatment of people who are forced to stay on the island.